Would you like to optimise your water treatment processes? The test runs can help optimise the parameters and functionality of your processes. Would you like to have more information on the functionality of the processes under different conditions? By field testing we can verify the functionality of the processes and improve the purification efficiency on different sites and under different process conditions. Does your company need monitoring and simulation services? Our database services as well as our extensive expertise in data handling and analysis are available to you. Do you need to update your water safety know-how? We offer you an extensive education programme to develop your know-how in the water safety field. Our pilot scale movable testing equipment makes successful process testing possible on the field sites defined by the client. The operations are supported by our water laboratory with high analytical capacity. We test and develop water treatment processes, chemicals and equipment. In addition, we develop bioprocess applications for water treatment and biorefining. Our comprehensive test results provide new information on the features of your product to help you find a new path for your development work. Water safety and waterworks operations are our strengths. Water treatment laboratories serve as learning environments for our environmental engineering education as well as for tailored training courses for companies. The environmental engineering department offers companies and communities field-specific product development and testing services and does applied research work in cooperation with companies and different research institutes in the field. International cooperation is important part of the department. Applied research work concentrates on water safety and bioprocesses. The applied RDI work in water safety focuses on monitoring and simulation methods as well as on developing and testing the purification technologies especially in communal water supply, agriculture and industries with high water consumption such as mining and pulp and paper industries. As to bioprocesses, the focus is on developing new applications especially to convert organic industrial waste streams into energy and bio raw materials with the help of microbiological processes. The special strength of the environmental engineering department is the capability and capacity of pilot-scale testing of water purification technologies and monitoring systems and applying these into practice. This makes it possible to apply new information and put it into practice in workable solutions. Moreover, it enables the testing of new innovations on the client’s field site. Pilot-scale testing and related equipment offer companies a unique possibility to test and develop new product innovations in the water sector. 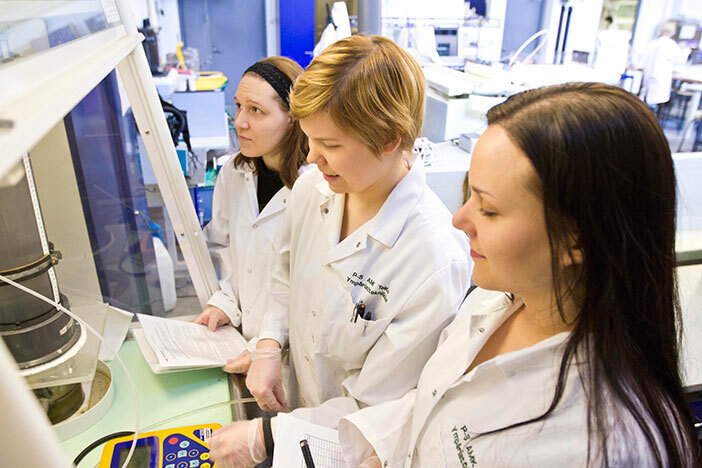 One of the strengths of Savonia UAS is close cooperation with the research institutes in Kuopio Science Park and with international partner universities and universities of applied sciences. Savonia UAS has active cooperation with i.a. the University of Eastern Finland, Geological Survey of Finland, Natural Resources Institute Finland and with National Institute for Health and Welfare. Savonia University of Applied Sciences professionals and students offer support for businesses in co-operation with a network of experts. Offered services are among others training, education, research, development, innovation, testing and laboratory services.